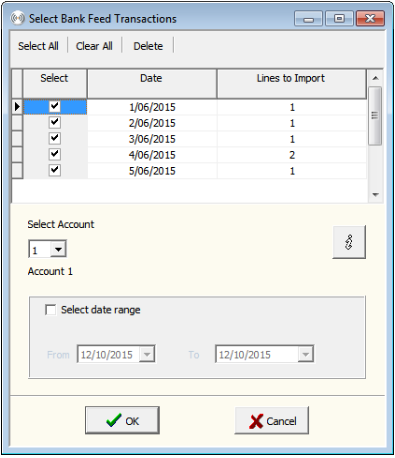 Bank feeds will begin to automatically arrive in your farm business about 10 working days after you have signed and posted the Bank Feeds Authorisation form to CRS Software. If you click on the Bank Feeds button in the Transaction screen before the set-up process is complete you will see the following message. To manually import transactions, have a look at Import your bank transactions if you don't use Bank Feeds. Once the feed is active, you'll be able to import bank feed transactions. 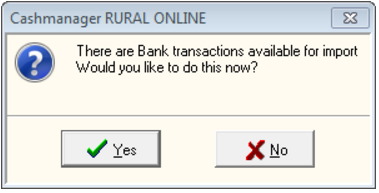 Click ‘Yes’ if you want to feed available bank transactions into the Transaction screen. NOTE: The prompt continues to appear every time you enter the Transaction screen until you import all transactions. In the Select Bank Feed Transactions screen, you can select the account and transaction dates you want to import, or you can bring transactions in for a specific date range. Click OK to bring the transactions into the Load Bank Transaction screen, where they need to be coded before moving them into the Transaction screen. If you use Autocoding, check to see if they're still active. Click Here to find out why.